Tuk tuks, or trishaws as they’re sometimes called, are ubiquitous across South Asia. Sri Lanka specifically is home to over 1.2 million of the three-wheeler vehicles—that’s more than one tuk for every twenty people on the island. But lately, on the streets of Colombo, they’ve been given a bad name. The reason? “An increase in incidents involving tuk tuk drivers in the Colombo area inappropriately touching female passengers.” At least that is the opinion of the U.S. Embassy in Colombo, which put out a security message on June 26th urging its female citizens travelling here to avoid riding in tuk tuks alone, and offering suggestions to prevent similar incidents. But the “incidents" in question are hard to pin down. According to Police Media Spokesman Ruwan Gunasekara, there were only four incidents reported against tuk tuk drivers island-wide in 2016: one sexual assault, one sexual harassment, and two incidents of cheating on the meter. So far in 2017, only three incidents have been reported island-wide: one sexual harassment and two incidents of cheating on the meter. “All these tuk tuk drivers were arrested and tried,” said Gunasakara. When asked for an explanation of the incidents referred to in the embassy statement, or for the data behind the decision to release such a statement, the U.S. embassy refused to comment. Instead, a spokesperson simply reiterated that the warning was aimed only at American women in Colombo. Yet the decision to warn against an entire industry because of the actions of a few, even if the intended audience was limited, is already having grave consequences for the tuk tuk drivers. Mohammed Ibrahim, a forty-two-year-old father of four children, has driven a tuk tuk for twenty years. But, he said, since the U.S. embassy posted its warning last week, business has been slow. His routine for the past five years has been to wait for potential passengers outside of the Fort Railway Station—now more than ever before, people just walk by him. There is also the potential for the embassy’s warning to affect Sri Lanka’s growing tourism industry, said Tourism Ministry Secretary Janaka Sugathadasa. He emphasized that “while there may have been some isolated incidents which we are not denying, by and large we don’t agree with the embassy on this warning.” He concluded that inasmuch as these incidents have presented themselves, the Tourism Ministry has been doing all it can to address them, such as arranging various training programmes for tuk tuk drivers throughout different provinces on how best to interact with foreigners. Of course, this is not to say that the incidents, few and far between as they may be, aren’t problematic. Any situation in which a person’s safety is at risk should be taken seriously and treated with the utmost caution. And both foreign and local Sri Lankan women did express some concerns similar to those outlined by the U.S. embassy’s message. However, most of the women we spoke to felt the embassy’s message either went too far or omitted what they view as more helpful advice. For instance, of the “security tips” provided by the embassy, the first is: “Females should avoid travelling in tuk-tuks alone in Colombo.” Yet most women have explained that while they may refrain from taking tuk tuks alone at night, almost all feel safe taking them during the day—an important distinction which the embassy’s message didn’t make. 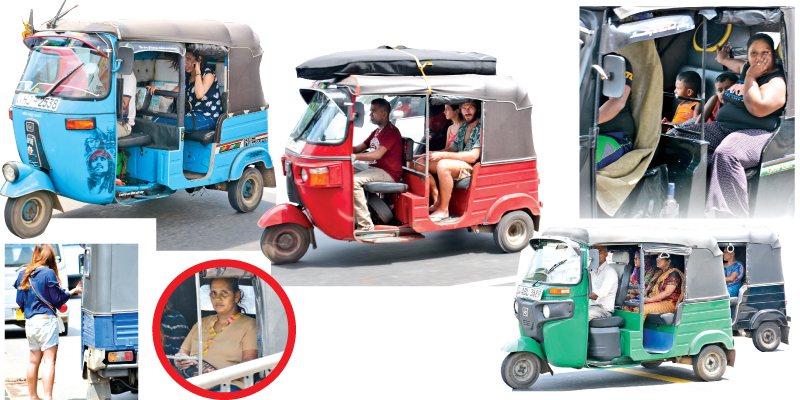 A group of four Sri Lankan female students studying at international universities, all aged 20-21, said that even though some of their parents were strongly opposed to them using tuk tuks at night, they were all fine with the use of tuk tuks by their daughters during the day. As well, another security tip provided by the embassy—“Use a company that tracks your ride rather than tuk tuks...”—fails to acknowledge that there are specific ride-hailing applications in Colombo which track rides for tuk tuks, such as PickMe, and therefore address this very issue. This omission is significant, since almost every woman we spoke to said they would feel comfortable alone in a tuk tuk, not just during the day but at night, too, so long as it was hailed through PickMe. At issue for many hesitant to use tuk tuks seems to be the lack of regulations governing the vehicles. But as Perera hinted at, applications like PickMe have, in their own ways, taken the regulating of tuk tuks into their own hands, making the option of a tuk tuk ride an even safer one. Portia Ratnayake, the Vice President of Communications for PickMe, said the company has gone to great lengths to ensure the safety of its passengers in tuk tuks, both during the ride itself and before the ride ever takes place. During the ride, said Ratnayake, the app’s interface contains features such as the aforementioned SOS signalling, in addition to ETA (estimated time of arrival) sharing, which allows passengers to share a live feed of their trip with friends and family. And long before the ride even begins, every potential tuk tuk driver is thoroughly vetted. In Ratnayake’s own words, “We require extensive documentation from the driver and vehicle owner upon registering with our service. This includes a police report and GM report (‘grama seveka’ certificate) along with multiple billing proof and documents that support the identity of the person registering with us.” Finally, PickMe also conducts in-person interviews with every tuk tuk driver before hiring them. So perhaps more factors should have been weighed—such as the potential for harming the livelihood of tuk tuk drivers and Sri Lanka’s tourism industry, as well as the role of ride-hailing apps in making tuk tuk travel more safe—before such a message was released by the U.S. Embassy. At the end of the day, any mode of transportation carries some risks. But it would seem that too broad a stroke was painted when characterizing tuk tuks in general as unsafe for American women.